I bought this compressor thinking it was a good deal, I used, and a it a few times to blow up a car tire, then for a roof and a few pieces of trim work. Then the regulator (thing that controls outlet pressure) control stripped out. I beleive its because it is cheap and it cant handle the pressure in the tank being on it over time. and no i didnt leave the tank with pressure in it all the time. A quick fix to get you by if you cant for a new part or like in my case it gets stripped out, is to take a pair of vice grips and pull off that red nob you use to change the pressure, then take a metal tap and re tap it for a bolt then just tighten or loosen a bolt to change the pressure. But be advised that its not very sensitive after you do this and you will have to reset the pressure every once in a while throughout the day. So Again if your looking for a compressor this isnt it. I have never used the Bostitch but I have heard they can be trouble. A lot of the smaller cheaper compressors seem to be having trouble. I went through 2 Porter Cable 6 gall compressor and finally the third one works great. Thanks for the review. The only issue I have with it is in the placement of the shut off switch. It is positioned so that, if I am not careful, it gets tripped by hitting my leg when I am carrying the compressor to another location. I occasionally forget about it being off when I then plug in the compressor. Thanks for the review. Thanks for the review. I was looking at this set-up, since my twin tank compressor from Bostitch has been good. I thought this would be a lighter one to have. Sorry to hear about your bad experience, I have bought a few of the cheaper pancakes and they do fail for some silly reason. 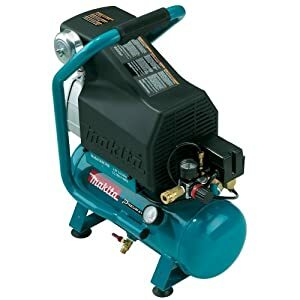 Just recently I bought a small Makita air compressor and boy does it make the others look like peewee compressors. I have two of the pancakes from Lowe’s sitting around because of some sort of failure. It’s the Makita MAC700 Big Bore 2.0 HP Air Compressor. This thing is really quiet and can push a framing nailer without a problem. It couldn’t keel up nailing together a long header, but that’s nailing more than 30 nails really quick. I love it and for $207 shipped to my door from Amazon, I felt it was a great deal. compressors are problematic. I did a lot of research and finally bought a twin-tank 2.5hp Makita, the next step up from Sailor’s. It is oiled but I believe the oil-free can be a problem. I needed to replace a lot of fence after Hurricane Ike. I can actually work along side it in a 400 sf garage and not be bothered with noise. It’s that quite, and noise was a major consideration. I drain it after every use to prevent rust. If your in the market I’d recommend giving this one or Sailor’s a look. I had three of thier nail guns and took all of them back and got Porter Cable. They always seemed to jam. Sorry to hear about your bad luck with them as well. This review is about the compressor, but it is listed under the nailer, stapler combo heading. Your ranking lowers the average ranking for the combo. One could interpret this as a bad rating for the whole combo including the nailer and stapler. I assume that is not what you intended. As an FYI – I use a couple Bostitch nailers (but not their compressor) and I am very happy with them. Check out my blog about this same compressor a couple years ago. I complained about it on here and man did I stick my foot in my mouth. Gary Blanchette the Superintendent of Product Developement contacted me personally by e-mail and apoligized and asked me what he could do to make it right, They sent me a whole new compressor with a new 23 gauge pin nailer. Then he followed up asking me if everything was ok. So contact him. For those who have a noisy compressor but aren’t ready to jump on a newer, better, and quieter compressor, try enclosing your compressors. The enclosure can be a dedicated box (lined with carpet inside), your cupboard, or just your stock sheets (placing your compressor behind your plywood sheets). I put mine in the far corner behind some lumber sheets and use it with a hose reel. Of course, I wear ear muffs all the time when I am in the shop using power tools (T/S, DC, and bench top belt sander are on a lot of the time anyway).